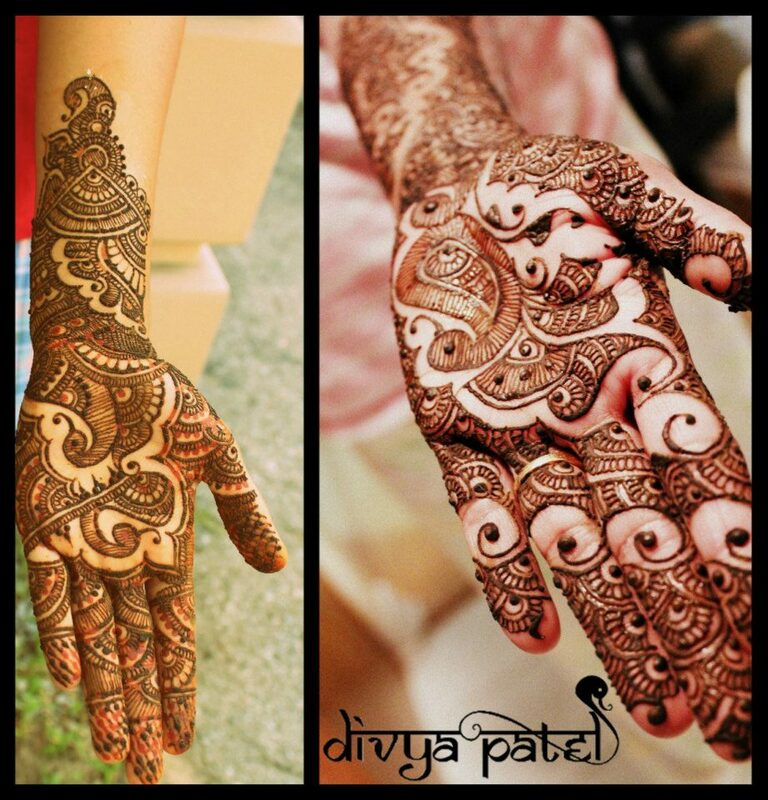 I had the privilege to interview the lovely Divya Patel from Toronto, Ontario on her beautiful mehandi designs. 1. Tell us about yourself – when did you begin applying mehandi and how did u think of getting into this line. I started doodling with a mehandi cone when I was only around 9-10 years old. It came quite naturally to me because from a very young age, I was very fond of art. As a little girl in India, I’d also seen mehandi designs done tons of times – be it on festivals, weddings, parties or just for the heck of it. I remember getting my first client when I was only around 12. At that time, I applied mehandi only for fun and because I loved doing it so much. As I grew older, I got calls from more people (through word-of-mouth) and I realized that I should make my hobby into a business. I never really thought I’d be doing this professionally but now I am and I love it! I’m truly grateful to my family who have supported and encouraged my love for this art. It’s quite recent actually! I was at a mehandi/sangeet that was hosted by the groom’s side of the family. Usually I try not to take too many breaks when I’m working because I don’t want to have people sitting and waiting for me – after all it a part of their big wedding day and I wouldn’t want, in any way, to cause them any trouble. So, when the groom’s mother told me to take a break and eat something, I told her that I’d do it as soon as I finished applying henna for the guests. However, it turned out that there was a long list of people who wanted to get their mehandi done and so I continued working. After an hour or so (and a whole lot of trying to convince me to eat), the groom’s mother brought some food in a plate, sat beside me and actually fed me. She was so incredibly sweet & it was almost as if I had known her for years! I was so touched (not to mention that the food was delicious). 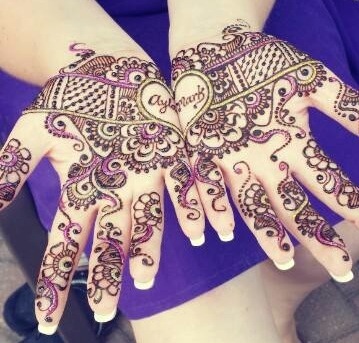 Leave the mehandi on – Try to leave the paste on for at least 4-6 hours before scraping. For the best results, leave the paste on overnight. Avoid water – Use a butter knife or rub your hands together gently to scrape the dry henna paste. Do not use water, as this will not allow the stain to darken to its full extent. Use a lemon juice/sugar mixture – Using a cotton swab, gently apply the mixture on your dry henna paste. Once you’ve removed the dry mehandi paste, it’s also a good idea to rub coconut oil or Vicks VapoRub to achieve a darker stain. You can contact me on my Facebook page here. Enjoy mehandi designs by Divya Patel. (Published with permission of Divya’s Henna Art. Please don’t use these images without permission from the original source). Wow amazing! I really love henna tattos and this designs are awsome! Am glad you liked it! Stay tuned for more lovely mehandi designs!